I’m just reporting, of course, so let’s not kill the messenger. 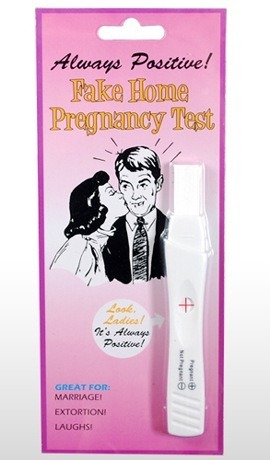 Don’t think of this fake pregnancy test as a cruel/hilarious joke to play on your significant other but as more of a relationship barometer. If your boyfriend, fiancé, or husband sees that you’re with-child and reacts happily, hooray! If he creates a him-shaped hole in the nearest wall, also hooray! It just wasn’t meant to be. Now you know that and you’re free to call up the guy you went to high school with who was insanely popular ten years ago but now he works as a courier for his dad’s law office and the last time you saw him he was totally into you. Either way, this one’s a winner.